The well-engineered keyboard mechanism is quiet and well laid-out. 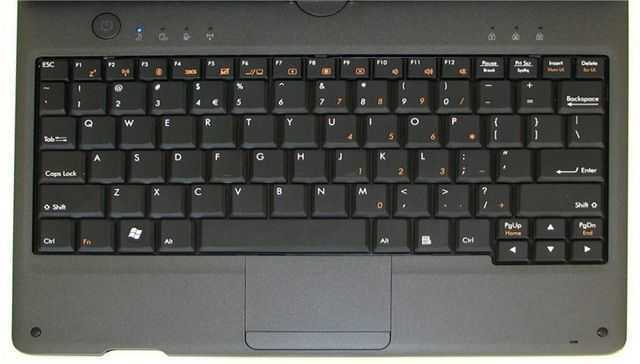 Key pitch is 17mm which is slightly less than on many netbooks. Key travel is slightly shorter than normal There is a slight amount of flex if you push hard on the keyboard but it’s nothing that anyone should worry about. The Synaptics multitouch keypad is sensitive and comes with the usual options for multi-finger gestures and tap-to-click which is important because we don’t find the single mouse button bar that easy to use. It has very little feedback is is quite hard to press. The LED-backlit screen is a 10.2 inch part with a 1366×768 resolution. The resistive touch layer is three-point capable (see below) and the finish is something between matt and glossy. Brightness is OK, color and contrast is good and left-right viewing angles are good. The same can’t be said of vertical viewing angles. There’s a fine focal-point. This won’t affect landscape viewing but it does affect portrait viewing at close range. Each eye gets a different color balance and it can be off-putting. The effect is only noticeable at close viewing distances (say, 30cm or less) but could be a deal-breaker for those wishing to do long-term reading on the device in portrait mode. The screen rotates through 180 degrees and back on itself to provide a tablet-like experience and the mechanism is good. The only issue we’ve found is a lack of locating holes that are used to lock the screen into position although the hinge does a reasonable job of holding the screen in position. The 1366×768 screen offers more ‘real estate’ in a 10 inch device than many other netbooks but this comes at the expense of readability and ‘touchability.’ We found that a comparable device with a 1024×600 touchscreen was much easier to use with the finger and at the 80-100cm distance for desktop operation, the font sizes needed to be bumped up to 125% for the best readability. However, configuring the Windows 7 for bigger window elements and fonts is an easy task and the end effect is that the 1366×768 screen can be configured as you prefer it; either for more screen area, or easier finger/stylus operation. The SDHC card slot is easy to access and accepts the card until it is flush with the front of the device. The spring loaded slot allows the card to be removed easily. In a quick test with a cheap 2GB micro-SD card in an adapter, the write speed was around 2MB/s. Read speed easily topped 8MB/s on the card we tested. Like the Viliv X70 and S7, the S10 includes a file transfer port. It’s an easy and quick way to get files to and from the device. You connect a USB to USB-Mini cable to the USB-Mini port on the S10. When you connect the other end of the cable to a Windows device (Mac and Linux not tested) the built-in USB storage contained within the S10 kicks off the ‘autorun’ feature and starts up some software that allows you to transfer files on to and from either device. Write speed (transferring to the device) in a test between the S10 and a Gigabyte Touchnote with a fast SSD was over 12MBytes/s. (about 100mbps) Transferring files out from the S10 was about the same.